MiaDonna is an eco-diamond company that focuses on crafting jewelry made with love. My Crown Vintage Engagement ring is from MiaDonna. I am impressed with their ethics and story! When MiaDonna founder, Anna-Mieke Anderson began learning the harsh realities of the diamond industry, she felt compelled to take action. Upon realizing she had most likely purchased a conflict diamond, she took her ring off and began to research. 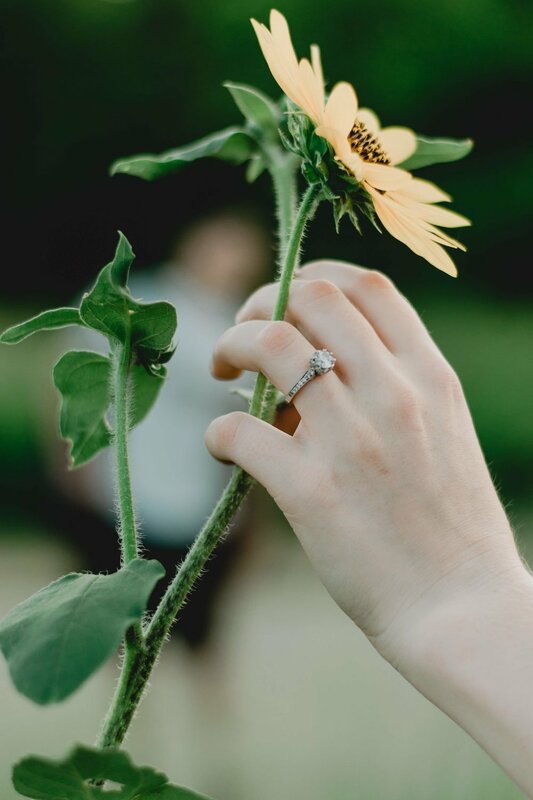 She was struck with irony learning how women, a compassionate, caring gender, were wearing a ring symbolizing love that had caused pain for others, including children during the creation of this jewelry. This inspired her to start sponsoring a child in Liberia, Africa. Through the sponsorship she was able to write Ponpon, a 7-year-old child living in a diamond mining community. This gave Anna-Mieke the chance to hear an unfiltered perspective of life in the diamond mines through the eyes of an innocent child. Eventually Anna-Mieke was able to meet Ponpon in person which inspired her to continue her work transforming the diamond industry. Anna-Mieke discovered only 1 in 9 diamonds can be backtracked to their original source. And the popular Kimberley Process Certification Scheme, some of us might have heard of….isn’t really conflict free. But if you walk into a diamond store and ask if their diamonds are conflict free, customers will be told, yes, our diamonds are conflict free, certified by Kimberley Process. This certification just means the money from the diamonds is not financing war. However, this does not take into account human treatment, child labor, or human-trafficking. Along with the environmental impact, the environment from diamond mines cannot be restored due to the depth of the digging. Miners are forced to dig so far down that the environment is unable to regenerate. Anna-Mieke wanted to find a truly conflict-free diamond and started looking at science. She decided to create an ethical engagement ring by using lab-grown diamonds. Lab-grown diamonds are chemically, optically AND physical the SAME as mined diamonds! So awesome! Lab-grown diamonds have seven times LESS environmental impact than mined diamonds. Along with their lab-grown diamonds, MiaDonna uses 95% recycled metals. Fun fact, did you know there is enough gold and platinum mined today that we don’t need to mine anymore?! Crazy! MiaDonna has a showroom in Portland, Oregon, but is a primarily web-based business. With their popular Home Try-On Program, allowing customers to find the perfect ring in the comfort of their own home. Shipping is a key part of their business. To account for this environmental impact, for every purchase made a tree is planted through MiaDonna’s partnership with One Tree Planted. MiaDonna sets aside a minimum of 5% of profits to donate to their non-profit Greener Diamond Foundation. Anna-Mieke wanted to start her own non-profit so that she was able to monitor how the money was being used to help communities. Last year MiaDonna donated 22% of profits to fund a new Agricultural Training Center set to open in early 2019 in Liberia, Africa. For a while, farming was outlawed in certain parts of Africa because the land was so valuable with diamonds, therefore, farming was a lost skill. MiaDonna wants to help make these communities self-sufficient by teaching them how to farm. Other programs also include training programs in Tonga and a Women’s Empowerment Center in Liberia. This new training center will allow people from the community to have a central place to come and learn various skills. MiaDonna founder, Anna-Mieke Anderson is very hands on and travels to Africa to manage projects for the Greener Diamond. She also still keeps in touch Ponpon, the boy she sponsored at the beginning of her journey. Ponpon has now graduated high school! I am so impressed with Anna Mieke’’s drive and passion. MiaDonna has incredible ethics! To read about my specific engagement ring click here. I highly encourage you to research the diamond industry and learn more through the resources on MiaDonna’s website. I’m proud to be wearing my conflict free diamond! If you're interested in learning more about my specific ring, click here. I’m glad that MiaDonna is the first stop on our journey for planning a socially responsible wedding! I can’t wait to share with you all my discoveries! We plan to visit the MiaDonna showroom in Portland when we purchase our wedding bands! Woohoo!